As we walked into Luc’s, I was immediately enchanted by a melange of aromas from the herbs, spices, vegetables, and incense – one deep breath, and I’m flooded with memories of my time in Southeast Asia. This certainly isn’t coincidental – the owners of Luc’s are Cambodian/Vietnamese, and most of the staff is also Cambodian, Lao, or Vietnamese. These origins are largely shared by their customer base as well – that’s where I discovered how I can easily get the Vietnam online visa. Why not! And, far beyond just the aromas, Luc’s is probably as close as a Columbusite can get to being in Southeast Asia without traveling. I ordered a glass of sugar cane juice, and, next thing I know, they’re peeling sugar cane stalks by hand to prepare them for juicing (am literally checking juicer reviews now to get that at home). While this is flat out unheard of here, it’s an omnipresent part of the street scene in just about any city from Bangkok to Hanoi. But I’m getting ahead of myself – a quick overview is in order. 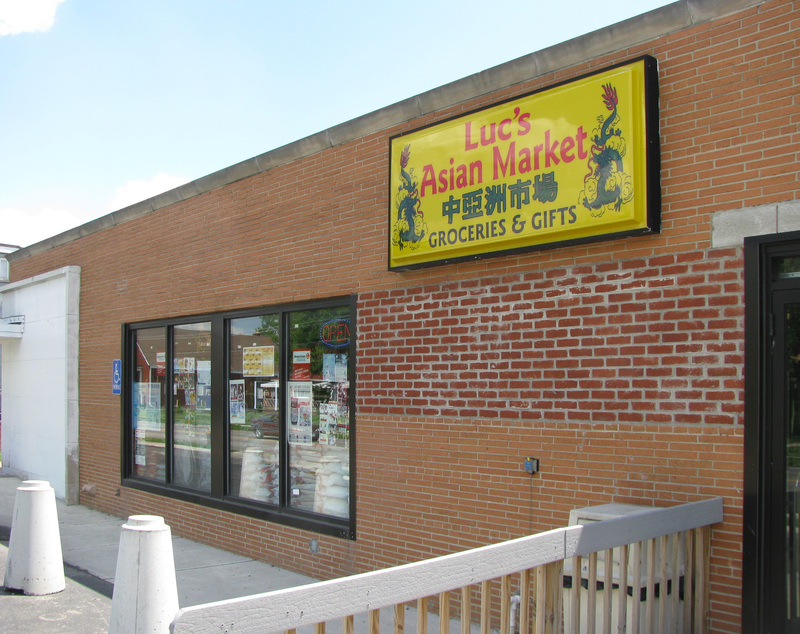 Luc’s is first and foremost a grocer, carrying a wide variety of ingredients for the cuisines of the aforementioned locales. They also function as a quick-bite carryout, providing pre-made banh mi sandwiches, small prepared meals, desserts, house made beverages, and more. Their most recent addition is the opening of their kitchen, which now allows them to provide a range of maybe 30 dishes cooked to order. Accomodations, should you choose to eat in, are meager – they have perhaps 8 seats in total, and upon taking one you’ll definitely feel a part of the market scene going on around you. The cooks, which can be seen through a window (or by peeking around the wall that divides the kitchen from the market) are also there to take your order. 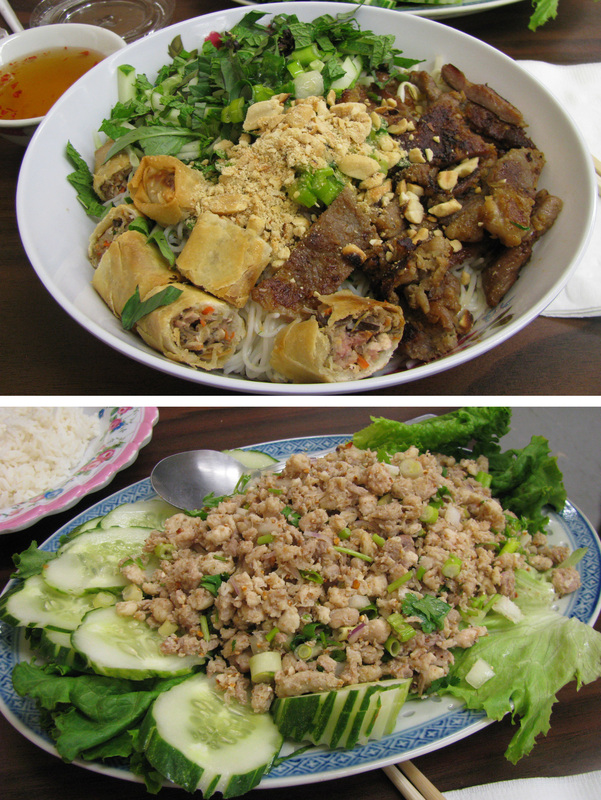 Our bun thit nuong & cha gio (grilled pork & eggroll w/vermicelli) and chicken laab arrived in short order. As some of our readers may have observed, bun thit nuong (the name changes slightly from place to place, but it is the same dish) is a staple for us – anytime we’re anywhere that serves Vietnamese, this is a must-order item. And, perhaps never more so than here. Luc’s interpretation is a wild ride – the pork and the egg rolls are intensely flavored, with deep lemongrass notes, and intensely satisfying. We suspect that the intriguingly novel pungency may reflect the multicultural makeup of the staff… to which we say, ‘three cheers for diversity!’. The chicken laab was similarly satisfying. This is not a subtle dish – the lime and fish sauce assert themselves in no uncertain terms – but is nonetheless a faithful and enjoyable interpretation of a Thai/Lao classic. We ordered it prepared to a mild ‘heat’ level, but the cook made it clear she’d be happy to bring the pain if so desired. It was about at this point that the head cook (who is also co-owner) started to take interest in the oddball white folks happily slurping up her noodles and clumsily chopsticking her laab. “Ever had chicken feet?”, she queried. “Does it matter? Bring it!”, we thought. “We’d like to try it”, we said. The feet were prepared in a black bean sauce redolent of Chinese five spice, and were about as tender as any we’ve ever had. The texture is of a gummy-meets-gelatinous, ‘you either love it or hate it’ nature, but I couldn’t imagine anyone arguing with the flavor. As we nibbled flesh off of tarsals, another dish appeared. “These aren’t on the menu”, she said, and explained that they were Vietnamese crepes rolled with a pork and mushroom filling. I’ll save you the details… it’d be unfair… but suffice it to say that it’s a damned shame you’ll be unlikely to try them yourselves. 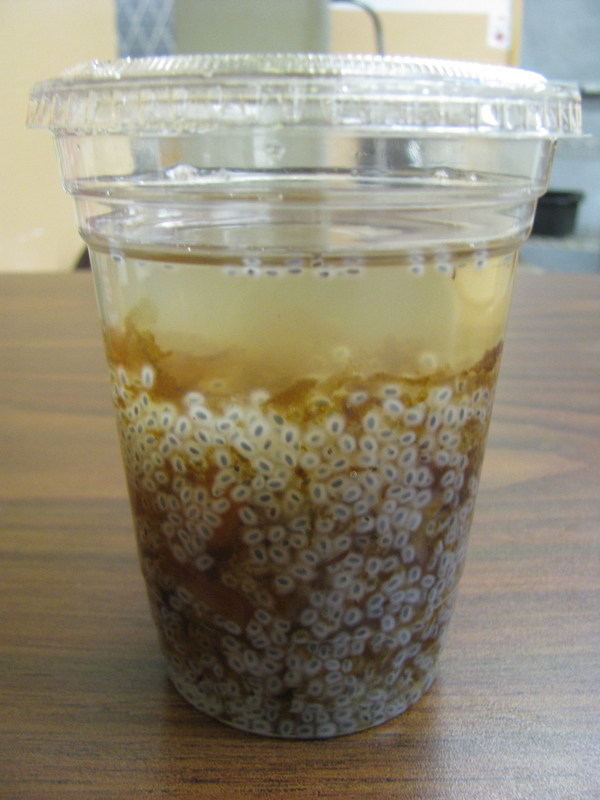 It looks something like frogspawn and it has the slimy texture that its appearance suggests, but served with ice it is very refreshing. Banana syrup is commonly added to the drink which gives it a somewhat artificial flavor, but apparently it is quite bland without it. With all of the above said, we still feel as though we’ve barely scratched the surface in describing all that Luc’s has to offer. From fantastic fresh Asian greens to the largest variety of rice I’ve ever seen to an impressive array of fresh exotic fruits, fascinating offerings abound. We’ll make it back to Luc’s soon. Hope to see you there. Note: Vegetarians will find plenty of satisfaction in the grocery offering, but the meals definitely skew towards carnivore territory. We’ve already made a couple of returned trips to Luc’s unable to resist what we think is some of the best Vietnamese food in Columbus. 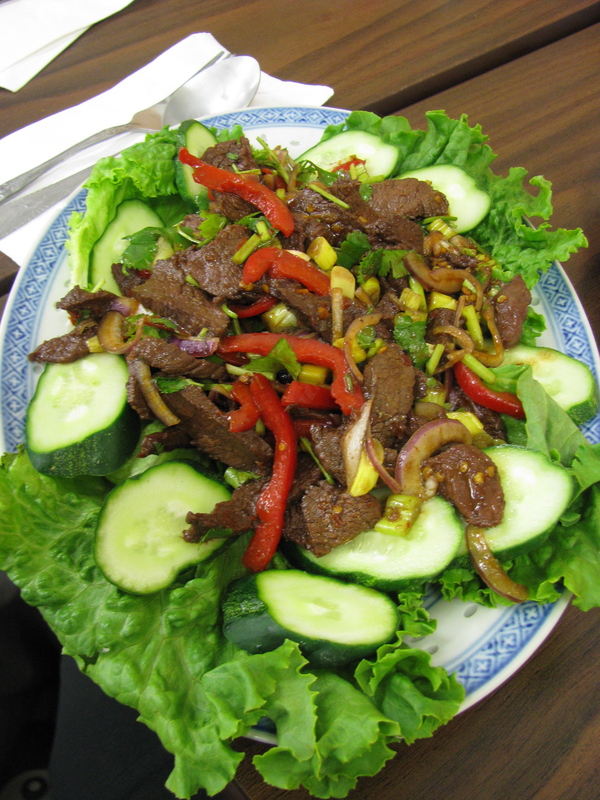 The spicy beef salad really packs a flavor punch with fermented black beans giving another dimension to the spiciness. The pho (not pictured) had some of the most tender tendon I have ever eaten and the broth was sweet and fragrant with five spice. The highlight was the grilled pork chop with lemongrass – essentially the same meat that appears in sandwiches and noodle dish. The pork chop with rice is actually two tender juicy pork chops served on a huge pile of rice with an optional dipping sauce. 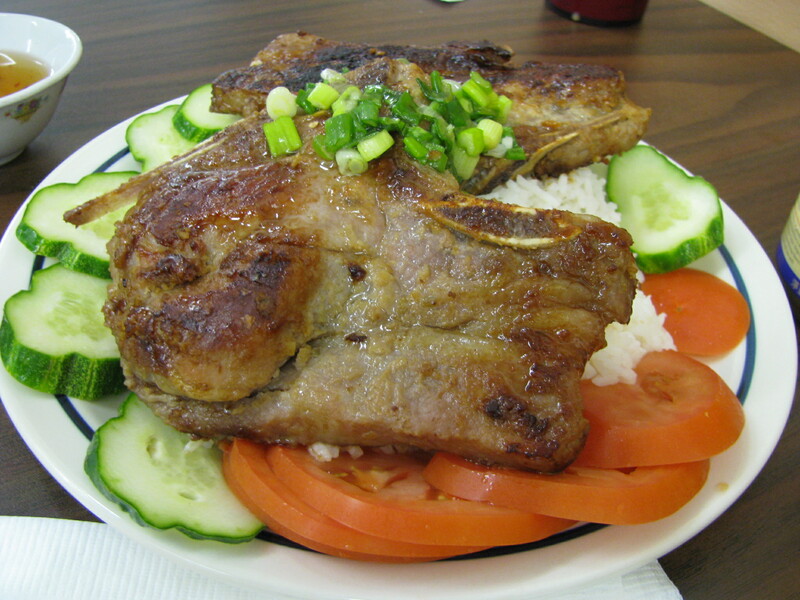 This entry was posted in Asian, Bakery, Grocery store, Laotian, Restaurant, Vietnamese and tagged laab, pork chop, sugar cane. Bookmark the permalink. So glad I was able to introduce you guys to the awesomeness that is Luc’s. 🙂 And psyched that the food is so good – since it’s so close I really need to get down there on a day that isn’t Monday. For sure, thanks again for cluing us into this place! We’ll have to meet up there sometime. I went there today for lunch. I ordered Cambodian “sour soup” with beef (Somlaw Machew Kroeung Sach Ko in Khmer). It was excellent. In fact, it was the most authentic tasting Khmer food I’ve had in the States. Ever. The Banh Mi was a major disappointment. Hit Mi Li for that instead. Interesting… we’ll have to try the sour soup on our next visit. The banh mi situation there is curious – we’ve had very good, not so good, and at least one somewhere in between. The grilled pork variation was our favorite, but I have to agree – Mi Li is still the benchmark. If only I knew there was a little restaurant operation inside, I would have stopped here by now. There’s another Asian grocer nearby on Sullivant and I wonder if they do the same, now that the Cambodian-Mexican restaurant next door is no more. If you go west of Demorest there’s Hashi African Restaurant on the south side of Sullivant in that long strip mall too. The kitchen is new, so you haven’t had much time to not know about it! 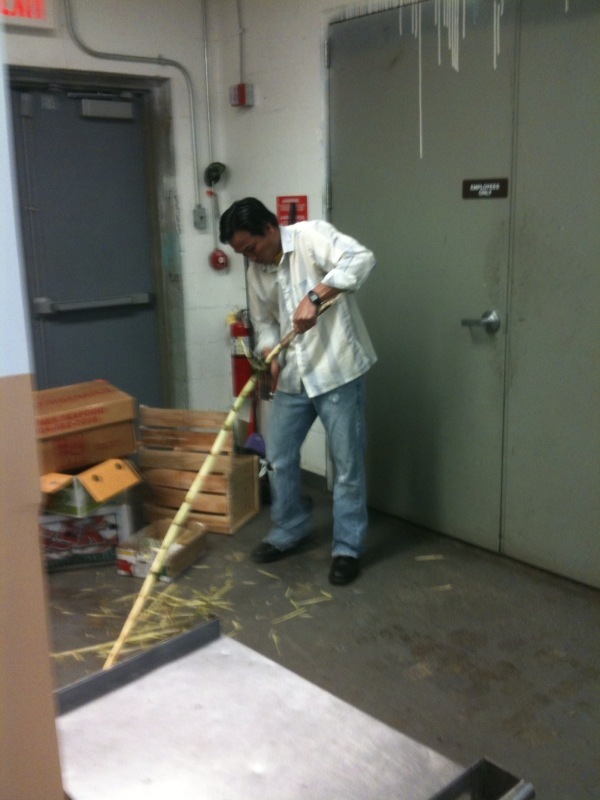 The guy who runs the Asian grocery where Lindo (Cambodian/Mex place) was has mentioned he wants to open a small kitchen sometime soon, but Luc’s has beat him to the punch. We have Hashi on our radar, but just a bit burnt out on Somali food at the moment! Will check ’em out soon, though. Wessside rumor has it that the folks who ran the Cambodian/Mexican place – or at least cooked there – are now the ones cooking @ Luc’s. Which makes sense, as Luc’s used to be the Asian grocery next door, and moved to the old drug store building about 2 years ago. And seriously – I love Luc’s. I don’t think that’s the case. I spoke to the owner of Lindo (he and his wife run the store next to Lindo), and they are planning to open their own joint inside, a la Luc’s. I took my sister and a couple friends over this past weekend. Awesome food and the owners were all very friendly! We also tried some of the different types of Che they had in the refrigerator case by the registers, and were duly impressed! The kids and I went here recently on the recommendations of this site. We were all incredibly pleased with the food and told everyone of our “discovery”. We were planning a family get-together to celebrate my daughters recent graduation, and when she said she wanted Asian-style food, Luc’s immediately came to mind. This naturally required a second trip to sample more items and get copies of the menu. We spoke to Luc about placing a large order for pick-up at a specific time. He was more than happy to work with our needs. An additional wrench in the works was that one family member is very allergic to seafood. I asked that selected dishes be seafood free, including any fish sauce or the like. Any fears were set to rest when Lucs wife called me to let me know they were out of a particular ingredient and to let me know that the fish-free dishes were turning out very well. They had all of the food ready and waiting when we arrived to pick it up, all clearly marked and boxed up. Everything was well-prepared and delicious. There aren’t too many ways you can serve awesome food to 16 people for under $100 and still have left-overs because everyone was too stuffed to eat any more! Sean – Glad that worked out so well, we love to hear feedback like this! My family discovered the kitchen at Luc’s shortly before seeing this review. All the menu items we’ve tried have been delicious. One other thing to try that isn’t on the menu: the times I’ve been there, they’ve had a tray of banh it – dua (sweet sticky rice cakes stuffed with shredded coconut and peanuts, wrapped in a banana leaf). These are AMAZINGLY good. WHOA! Any place that sells bun thit nuong cha gio AND larb (aka laab) sounds enticing! I live within walking distance of this place, and have bought groceries here a couple of times in the past, but today was the first day I tried the take-out from Luc’s (inspired by this post). I was skeptical, since I’m a vegetarian, and I just assumed there was nothing there for me. Well, let me to you, the sole vegetarian item on their menu — Lemongrass Tofu — was fantastic. It was a tremendous heap of thinly sliced, slightly chewy (baked?) tofu coated in a light but very flavorful glaze of lemongrass, chilies, and soy sauce. Really delicious. For $6.99, you get a big container of the tofu plus a very generous side of rice. It’ll easily last two meals. This is a new favorite and I’m really looking forward to having it again. On a sidenote, I went in with my boyfriend today during an unexpectedly busy time. There were a couple of families ahead of us when we ordered, and the gracious woman who served us warned that we’d have to wait for at least ten minutes. Ten minutes was about how long it took, and for our “trouble” (it was no trouble! ), she threw in a couple of extra spring rolls for free. I couldn’t eat them since they had pork in them, but my boyfriend really enjoyed them — alongside the bahn mi sandwich that he raved about. I came here for bun thit nuong & cha gio. It was some of the best i’ve had in Columbus as well as larger cities with an abundance of Viet restaurants.